Writer/director S. Craig Zahler returns with his third feature, Dragged Across Concrete, a grim and grinding buddy cop slow burn that takes audiences on a “Shotgun Safari” through the treacherous asphalt jungle. As controversial and unapologetic as its subject matter may be, Zahler’s ability to craft thought-provoking and challenging genre stories is undeniably sharp. Two policemen, one an old-timer, Brett Ridgeman (Mel Gibson), the other his volatile younger partner, Anthony Lurasetti (Vince Vaughn) find themselves suspended when a video of their strong-arm tactics becomes the media’s cause du jour. Low on cash and with no other options, these two embittered soldiers descend into the criminal underworld to gain their just due, but instead find far more than they wanted awaiting them in the shadows. Since his skull-crushing debut, Bone Tomahawk, Zahler has come be known as an erudite sculptor of slow moving, novelistic genre exercises that overflow with elaborately articulate dialogue, savage lashes of violence, and smears of political ambiguity. Dragged Across Concrete is certainly no exception; however, it is probably Zahler’s most controversial and challenging work to date. Many may choose to avoid the film simply due to its casting of Mel Gibson, whose own past includes spats of domestic violence and racial slurs, as a racist cop accused of using unreasonable force on the job. The film’s runtime may scare away the rest. However, those who stick it out may find themselves greatly rewarded. At a staggering 159 minutes, Dragged Across Concrete is Zahler’s longest feature to date, and its glacial pace may make many viewers feel as though they’re the ones being dragged across the pavement. The film’s length and esoteric nature will most certainly alienate everyone except true genre enthusiasts, but that doesn’t seem to concern Zahler in the slightest. In fact, his prime objective has always seemed to be that of challenging the viewer by denying the usual gratifications of a particular genre in hopes of delivering it via the unexpected. The film is a hangout film, similar to Quentin Tarantino’s Jackie Brown, and while it moves at the pace of an actual stakeout, Zahler still manages to find riveting pockets that allow us to get to know these characters and their obstacles before letting the bullets fly, making the emotional stakes higher if you’re able to become invested. Wholly subversive while delivering the mainstays of the genre, Zahler takes 2 desperate cops and 2 oppressed criminals (Michael Jai White and Tory Kittles) and builds up to an intricately entangled standoff that was, to me, absolutely spellbinding. And in true Zahler fashion, when the bullets finally start flying, no one is off limits, which allows its story to unfold in exciting and surprising ways. I personally found Zahler’s use of Gibson in a role that eerily mirrors that of his personal persona to be completely interesting despite the obvious, surface-level controversy. He and Vaughn have legit chemistry, and they make Zahler’s virtuosic dialogue sing. I love the back and forth exchanges they share, particularly Gibson’s character’s ever-changing assessment of their situation, which he breaks down in percentages. I never felt like Zahler was endorsing the ugly behaviors of these characters, but more so recognizing that this type of behavior exists and is worth examination, even it’s difficult to stomach. It feels like more of a statement that cinema does not and should not always be comfortable or pleasant, which will be apparent to some but not all. Masterfully structured and meticulously composed, the only off aspect to the whole languid, slow-burn epic is Jennifer Carpenter’s character, which doesn't service the plot at all. Her inclusion adds to the novelistic feel and makes the violence feel less compassionate, foreshadowing the fact that no one is safe, even the most sympathetic of characters, but it sticks out as an odd tangent from the main storyline. The film’s ending may leave many unfilled at first; however, there’s interesting subtleties that I found more fruitful on a second viewing. And as slow and long as the film may be, it absolutely merits multiple viewings. More about the ride than the finale, Dragged Across Concrete is uniquely Zahler, and while the subject matter is not for the thin-skinned or easily offended, it functions dually as an interesting conversation starter and a singular genre experience. Recommendation: Fans of Zahler and genre connoisseurs will find their kicks. Outsiders should check it out with the understanding that it’s slow burn in every sense. Rating: 4.5 anchovies outta 5. What do you think? 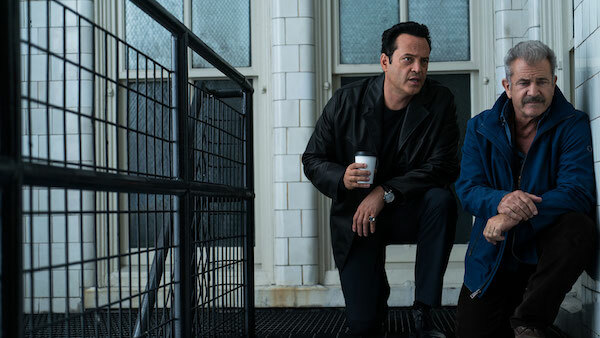 Were you floored or underwhelmed by Dragged Across Concrete? How did it stack up to the rest of Zahler’s work? We want to know. Share your thoughts and feelings in the comments section below, and as always, remember to viddy well!